Distinguished by its optically refined design, the APO-Summicron-M 75mm f/2 ASPH. from Leica is a bright portrait-length lens for M-mount rangefinder cameras. Its apochromatic designation is a result of the use of anomalous partial dispersion glasses to virtually eliminate color fringing and chromatic aberrations, as well as an aspherical element made from high refractive index glass to further control spherical aberrations for notable sharpness and clarity. The lens also employs a rear floating element to maintain image quality throughout the focusing range, even at the minimum focusing distance of 2.3'. Additionally, the compact lens also features a built-in extendable lens hood to shield the front element and the front is threaded to accept 49mm screw-on filters. Apochromatic design employs one fluorite element and one anomalous partial dispersion glass element to virtually eliminate chromatic aberrations and color fringing for improve clarity and color accuracy throughout the aperture range. In addition to the apochromatic designation, this lens also pairs a double Gauss type optical construction in front of the aperture with a highly refractive glass aspherical element, and a design resembling the Summilux-M 50mm f/1.4, behind the aperture, in order to significantly reduce distortion while also increasing overall sharpness and consistent illumination. A floating element is used to maintain clarity and sharpness throughout the focusing range, especially at close range. Manual focus design provides a minimum focusing distance of 2.3' with a maximum magnification ratio of 1:7. Built-in extendable lens hood shades and protects the front element to reduce lens flare and ghosting. Additionally, the front of the lens is threaded to accept 49mm screw-in filters. Box Dimensions (LxWxH) 5.8 x 4.7 x 4.4"
APO-Summicron-M 75mm f/2 ASPH. Lens is rated 4.9 out of 5 by 15. Rated 5 out of 5 by msolea from Favored Lens Superb This is an amazing lens. And, for all its character, sharpness, rendering and clarity of micro contrast, color, etc... it is my all time favorite lens... for its IQ and appeal. Even though it is not generally my go to lens, it is the one lens I never want to be without. Other lenses come and go, even the best lenses from Leica, Nikon, Voigtlander and Sony ranging from 21mm through 200mm come and go and there are some real wonderful lenses and lenses I would use more regularly than the Leica... I am keeping this lens unless I have no other choice. Moreover, it fits perfect with my now sony go-to primes with its 49mm filter thread. Rated 5 out of 5 by Winstoncat1 from A perfect portrait lens for the M Digital system I don't very often use this lens but I would be very reluctant to get rid of it. I recently sold my 90mm Summicron (pre asph) and I don't miss it one bit, although it was a beautiful lens. 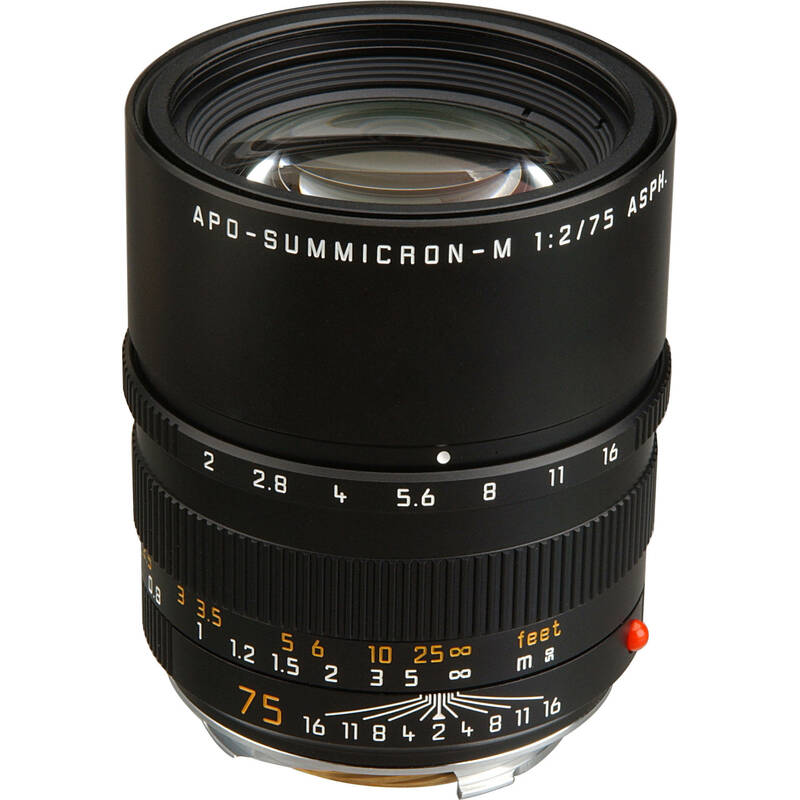 I find the 75mm summicron to be easier to use, for example, portraits or close-ups are straightforward and comfortable to obtain, with a shorter focussing distance resulting in a better view through the rangefinder or in live view. The black, aluminium, body of this lens feels reassuring hefty with that unmistakeable Leica quality feel to it. Focussing and aperture stops are of the usual exquisite Leica feel - overall, a wonderful lens that has a permanent place in my lens case. Rated 5 out of 5 by klinerm from incredible ... I didn't see how it could possibly live up to the hype written about it on the internet, but my opinion is now that it does, and then some. Images in the plane of focus are rendered undistorted, tack-sharp, and with a sense of immediacy that is a little hard to describe. Out of focus areas are rendered in a very pleasant, utterly non-distracting way. I have observed that while the best Nikon lenses (200/2, 85/1.4, 135/2, etc.) can certainly make superb photographs, some of this Leica glass makes you feel like you are almost there. Rated 5 out of 5 by Wang Man from This Leica lens is a gem I have been a Leica rangefinder camera man all my life, M4, M6, and now the M9. My old Leica M lens are still very nice, but when I mounted the 75mm lens to my M9, the shots are beyond belief, the sharpness, contrast, and bokeh are so refined, it is like capturing life at that moment. Moreover, you can take very close up shots with this lens. Leica lenses just are amazing. Rated 4 out of 5 by Arthur from Exquisite tool The resolution is almost clinical in nature, even when opened wide. Micro-contrast is high and can produce very compelling textures on your subjects. Contrast is also very high. Colors are exquisitely reproduced. If there are strong lights hitting the lens, it flares quite easily. Rated 5 out of 5 by M from Amazing Glass!! Awesome glass. I prefer this over the 90 APO ASPH as its a bit smaller and actually fills more of the frame due to the close focus limit. Renders very similar to the 50 Summilux ASPH and is ridiculously sharp wide open. Rated 5 out of 5 by John from Great lens Excellent lens , beautiful color contrast and ridiculous sharpness. Must have. Rated 5 out of 5 by Gary M. from Amazing results I am in the process of selling of my Canon gear and replacing it with Leica gear. The image quality produced from this lens makes the expense of going from Canon to Leica well worth the extra cost. On my M9, at 1600 ISO and F2, indoor shots were very crisp, sharp and well saturated. I have not had a chance to do much outdoor shooting with this lens but based on the indoor shots, my expectation -- while high -- will most likely be met. Does it (Leica Telephoto 75mm f/2.0 APO Summicron)come in silver? Unfortunately, this lens is only offered in black. The staff writer is wrong, this lens can produce amazing Macro results provided you have live view and some extension tubes like the Macro-Adapter-M.You won't achieve 1:1 but you'll get close and be able to amazing results with practice. Is this lens (Leica 11637) 6-bit coded?